Here at Spike’s, we love to see creativity and excellence in storytelling recognized. Whether it’s the trials of a small-town sheriff making his way through a world crawling with zombies or the political sabotage of a fantasy kingdom, we’ve been treated to a number of fantastic stories on TV this past year. The Emmy Awards recognize the foremost achievements in TV stories, and 2016 is shaping up to have some tough decisions. In 1949, the Academy of Television Arts & Sciences (ATAS) held their very first award show, recognizing excellence in the field of television around the Los Angeles region. In the decade that followed, the award process was changed to consider and recognize television programs across the country. In 1955, ATAS created a second organization, the National Academy of Television Arts & Sciences (NATAS) to assist with creating local chapters throughout the U.S. to better monitor the programming being broadcast. Over the next 60 years, ATAS and NATAS would create an international arm (IATAS) to focus on programming that initially aired outside of the U.S. and individual ‘chapters’ of ATAS began awarding achievements in local programming. Currently, there are six major Emmy Award ceremonies each year: The Technology and Engineering Awards, The Daytime Awards, The Sports Awards, The News and Documentary Awards, The International Awards and the most watched, Primetime Awards. 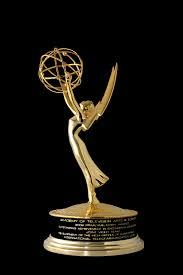 First called the “Ike,” and then the “Immy,” The Emmy trophy was designed by Louis McManus in 1948. 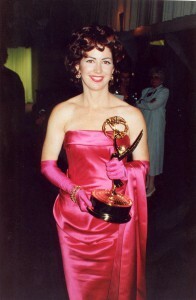 McManus used his wife as the model for the winged woman and depicted her holding an atom, to symbolize the academy’s dedication to uplifting the medium of television. Each statuette weighs just over six pounds and stands just under 16 inches tall. The Emmy is comprised of copper, nickel, silver and gold, sitting on a 7.5-inch base. Each year, the award is manufactured by R.S. Owens & Company in Chicago, Illinois. This year, TV’s most beloved shows will be facing off in 27 categories. The 68th Primetime Emmy Awards air September 18th, 2016. At Spike’s, plaques and trophies mean a great deal to us. We’ll be watching the awards to see which of our favorite shows pick up the Emmy this year. To learn more about getting your own statuette, call, click or stop in today. This entry was posted in Uncategorized on August 24, 2016 by Spike's Trophies. On August 28th some of music’s biggest names will descend upon Madison Square Garden to commemorate the past year in music. 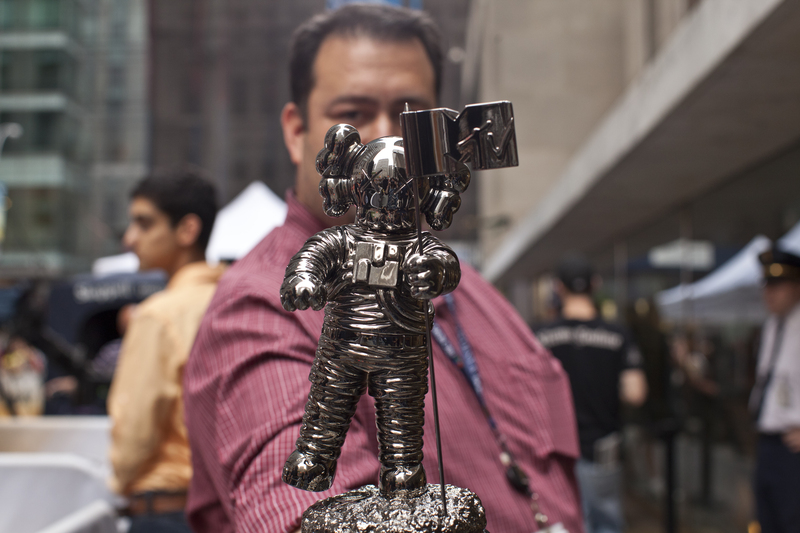 MTV will be celebrating the best artists and music videos with their famous ‘Moonman’ award. When MTV launched their cable channel in 1981, no one expected a channel that played promotional music videos 24/7 to succeed. 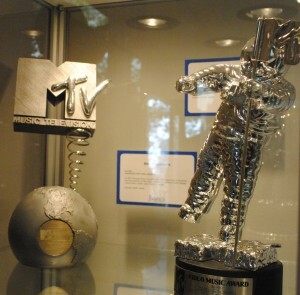 In the following years, MTV would become a behemoth of media changing the course of the music industry and making (or breaking) a number of artist’s careers. Three years after the initial launch of the channel, MTV began an award ceremony that would go on to be one of the major cornerstones of American award shows. The Video Music Awards, or VMAs, celebrate the best music videos of the year in genre and in technical achievements concluding with the video of the year. The Video Vanguard Award commemorates a particular artist’s lifetime achievement in the medium. Over the years, the design of the trophy has changed quite a bit. The ‘Moonman’ a depiction of an astronaut planting a flag on The Moon has remained constant, as has the engraved circular base, but the sizing, level of detail and colors have changed nearly every year. 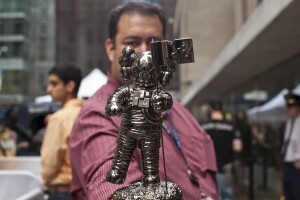 As an example, the 2015 trophy featured the Moonman wearing an oversized peace-symbol chain. In the 32 years that the award show has existed a number of infamous and controversial events have taken place. The first memorable event was Madonna’s performance of ‘Like a Virgin’ which has been parodied both for the costuming and for the performance itself. In the years that followed Andrew Dice Clay was given a lifetime ban from the awards for his vulgar stage antics, Krist Novoselic of Nirvana nearly knocked himself unconscious with his own bass guitar and a number of fist fights have broken out between musicians. The 2016 VMAs will feature 17 different categories for artists to receive awards and is sure to be yet another ceremony for the ages. At Spike’s we love a good award show, and the VMAs rarely disappoint. If you’re in the market for a plaque, trophy or something else to commemorate your favorite artist, Spike’s has everything for your own special award. This entry was posted in Uncategorized on August 13, 2016 by Spike's Trophies.